Well, a kind of Mince Pies. First of all because this are not pies, but tarts, mini tarts. 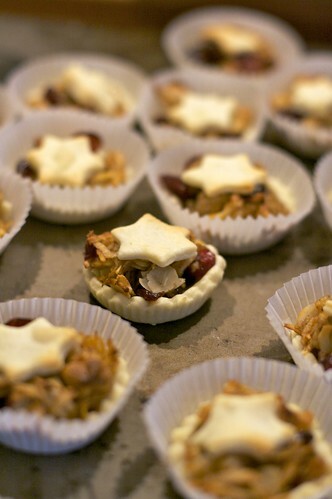 And second of all because I’ve never tried the real English mince pie, so I cannot know if they taste alike. The original recipe, from which those little pies are inspired, is from Modern Classics, Book 2, by Donna Hay. In a robot, work flour, sugar and butter until crumbled. Add enough water to make a silky dough. Let it rest in the fridge for at least 30 minutes. Turn on the oven at 180° C.
Peel the apple, discard all the seed, then roughly grated. Add the rest of the ingredients and let it rest in the fridge overnight. Roll put the pastry. Your choose to do one big (diameter of 18 cm) or many little pies (25 more or less). Cut paste accordingly. 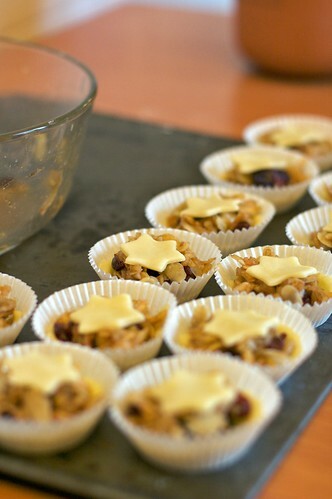 Fill it with 2-3 teaspoon of the filling, then decorate it with shaped scraped pieces of pastry, like hearts or stars. Bake it for 15 minutes, or until golden. Merry Christmas and Happy new Year! Much joy and sweetness to you and your family! I just discovered your blog (following the verrine trail). This is one blog I shall do from start to finish. 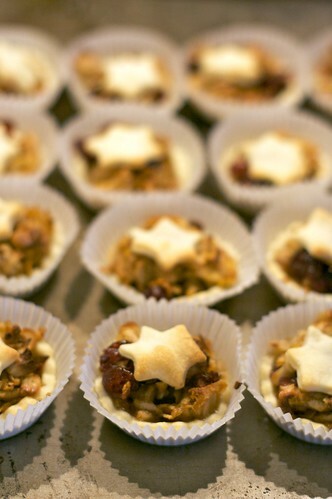 Have never made mince pies and it is a favorite of my father – so need to try this. Beautiful bites!